Enjoy the view in our Bush House, open plan living with three beautifully designed levels overlooking the existing pool and bushland views. The search for street appeal and something fresh. At the end of this St Ives cul-de-sac, it’s time to go for a tired 70’s brick veneer project home. This leaves a site that is bushfire affected, slopes down to bushland and retains the existing pool and cabana. 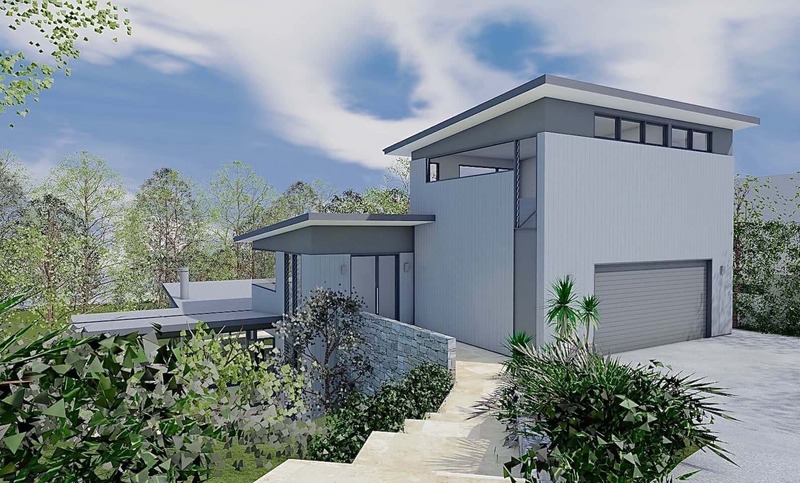 Our new home design is for a series of skillion roofed boxes stepping down the hill. A new orientation allowed for plenty of north sun, larger usable site area to the north and maintained the beautiful bush views. To build in a BAL-40 bushfire area we needed to avoid using any external timber, so we opted for Hardy’s Axon wall cladding, AWS Vantage aluminium windows and doors with a colorbond roof / fascias, and natural stone features.